Clarksville, TN – Despite the current below-freezing temperatures and ice and snow on the ground, Austin Peay State University saw the first of its spring sports begin their regular-season schedule’ this past weekend, with more teams to soon follow. The Governors women’s tennis team kicked-off the APSU spring schedule with a trip to Middle Tennessee on January 14th, with the Govs falling to the Blue Raiders, 5-2, in the first meeting between the two schools since 2015. 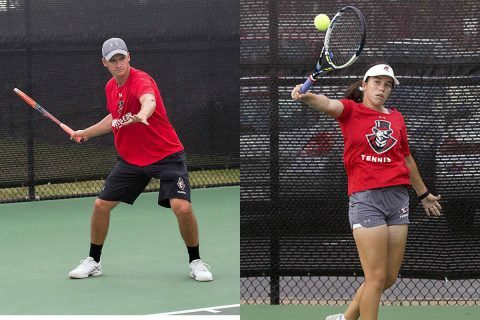 To no surprise, two-time All-Ohio Valley Conference selection Claudia Yanes Garcia picked up a win at the number one singles, while Fabienne Schmidt picked up the other APSU win at the number-three singles. The Govs will open the home part of their spring schedule on January 15th at the Governors Tennis Center, with a 1:00pm match versus in-state foe Chattanooga. Joining them in action on the 15th will be the men’s tennis team, as they traveled to Middle Tennessee for a 11:00am match versus the Blue Raiders. The Govs suffered a setback with a 7-0 loss to the Blue Raiders. But it won’t be long before the tennis team’s will be joined by some of the other APSU spring sports teams. The Governors softball team will open its first season under new head coach Rodney DeLong in just over three weeks, when they travel to play at the Georgia Southern Eagle Round Robin Tournament on February 9th. A week later, Austin Peay’s baseball team will kick-off its season opener at Raymond C. Hand Park with a four-game series versus Maryland-Eastern Shore, beginning on February 16th. Three days after the baseball opener, the men’s golf team opening its 2018 schedule at the Invitational at Savannah Harbor, in Savannah, GA, on February 19th, coming off three Top-Five finished during its fall schedule. March will see the final team APSU spring teams open their respective schedules, with beach volleyball kicking off their second season of play on March 2nd at the New Orleans Invitational. Next up will be the APSU women’s golf team on March 5th at the Battle at Boulder Creek III in Las Vegas, NV, while the Govs outdoor track and field team open-up their season at the Coastal Carolina Invitational on March 9th. So, while Governors fans still have the heart of the men’s and women’s Ohio Valley Conference basketball schedule to look forward too, spring sports are just around the corner.